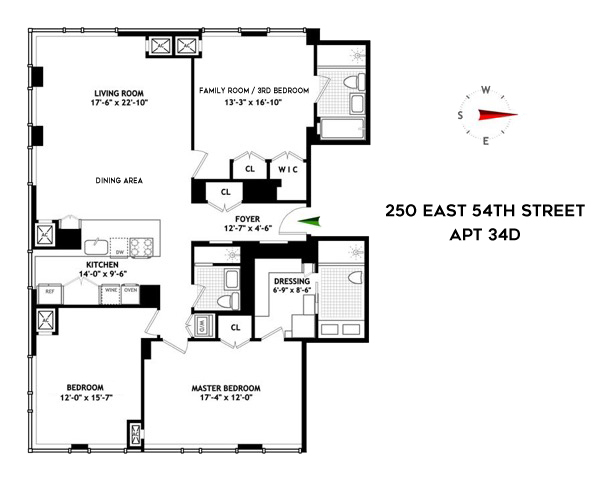 34D is a sophisticated three bedroom three bathroom home in the Mondrian condominium. With breathtaking city views from every room in the apartment, floor to ceiling windows allow for sunlight that lights up the beautiful mahogany herringbone wood floors at all points throughout the day. With southern and western exposures, the cornered dining room and living room give you ample possibilities to entertain. The 3rd bedroom off the living room can be turned into a media room or den and features ensuite bathroom for your guests. The galley kitchen has the opportunity to be opened up into the dining room living room. As it is now, it features Whirlpool and GE appliances and has a breakfast nook perfect for morning coffee. The master suite is very spacious with serene East River views, an enormous customized dressing room and outfitted closet and gorgeous bathroom featuring a soaking tub. Both the 2nd and master bedrooms are spacious with open city views, including the iconic 1936 Pepsi-Co sign across the east river. This apartment is also equipped with washer/dryer. The Mondrian Condominium has a full-time doorman, direct access to Equinox health club, additional laundry room, and bicycle room. Pets are allowed.